Citation Information: J Clin Invest. 2015;125(3):1339-1346. https://doi.org/10.1172/JCI79635. BACKGROUND. Recombinant human PDGF-BB (rhPDGF-BB) reduces Parkinsonian symptoms and increases dopamine transporter (DAT) binding in several animal models of Parkinson’s disease (PD). Effects of rhPDGF-BB are the result of proliferation of ventricular wall progenitor cells and reversed by blocking mitosis. Based on these restorative effects, we assessed the safety and tolerability of intracerebroventricular (i.c.v.) rhPDGF-BB administration in individuals with PD. METHODS. We conducted a double-blind, randomized, placebo-controlled phase I/IIa study at two clinical centers in Sweden. Twelve patients with moderate PD received rhPDGF-BB via an implanted drug infusion pump and an investigational i.c.v. catheter. Patients were assigned to a dose cohort (0.2, 1.5, or 5 μg rhPDGF-BB per day) and then randomized to active treatment or placebo (3:1) for a 12-day treatment period. The primary objective was to assess safety and tolerability of i.c.v.-delivered rhPDGF-BB. Secondary outcome assessments included several clinical rating scales and changes in DAT binding. The follow-up period was 85 days. RESULTS. All patients completed the study. There were no unresolved adverse events. Serious adverse events occurred in three patients; however, these were unrelated to rhPDGF-BB administration. Secondary outcome parameters did not show dose-dependent changes in clinical rating scales, but there was a positive effect on DAT binding in the right putamen. CONCLUSION. At all doses tested, i.c.v. administration of rhPDGF-BB was well tolerated. Results support further clinical development of rhPDGF-BB for patients with PD. TRIAL REGISTRATION. Clinical Trials.gov NCT00866502. FUNDING. Newron Sweden AB (former NeuroNova AB) and Swedish Governmental Agency for Innovation Systems (VINNOVA). (A) Patients were implanted with an abdominal drug delivery SynchroMed II pump connected to an i.c.v. catheter. (B) Front and top view of the lateral ventricular system (blue) in the human brain where PDGF-BB was administered via an implanted catheter, with its tip placed near the foramen of Monro. 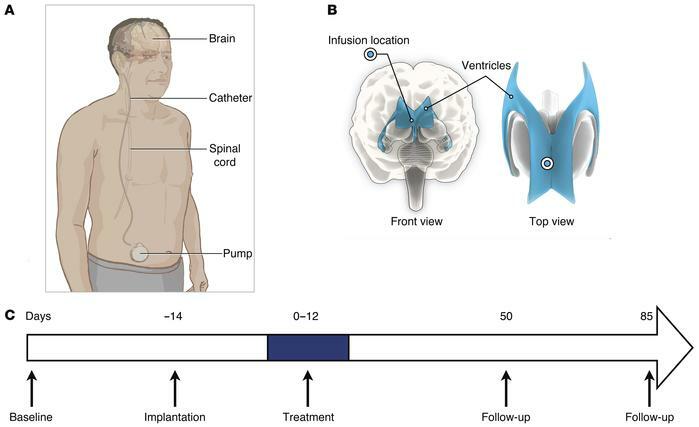 (C) Patients were examined at baseline, the catheter and pump were implanted, and the treatment with PDGF-BB or placebo was started within 14 days of surgery.